I have been blogging since 2007 and yet I've never taken part in a blog-hop before. It's about time to put that right, don't you think? I discovered the delicious Miss Smith through a competition on UKScrappers and I was instantly drawn to her quirky style and distinctive journalling. I've been a fan ever since, so when she offered a giveaway with a difference, I think I waited approximately 30 seconds before emailing to sign up. In the midst of some hideous work stuff and incredibly intense study, it's been good to have something crafty to focus on. And with so much change going on in my life, it seemed like a good time to do a review of life right now. (Also, I love this photo). So, the embellishment is part of the blog-hop...but in honour of Miss Smith herself, and because it was her style that drew me to her blog in the first place, I thought I'd take a bit of scrapbooking inspiration as well. So, ledger paper, lots of journalling...and a picture of a cup of tea. And then, my banner was inspired by Sian, who is also blog-hopping today. If you are taking the tour, then please visit the next sweet blogger on the list, who is the lovely Joanne. There are so many wonderfully talented people taking part today, I hope you can visit them all. Hi Kate :) I love your banner! A perfect spot for that embellishment - aren't they just the cutest? It's a beautiful page all round actually. I love it. 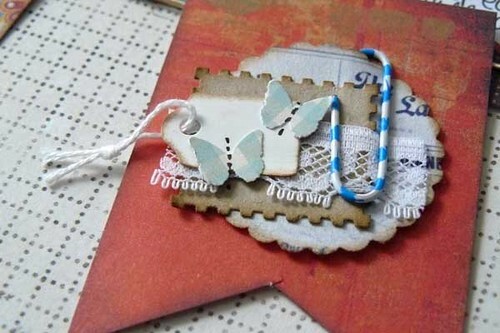 Love how you did a 'Miss Smith' LO and how you used the embellishment! Love how you've used those letter stickers, and the banner is awesome. I love the design but also the heartfelt journaling and the way you did it mixing alphas and handwriting. The banner and the photo are beautiful! Just a really great page! That Thank-you note is such a nice and thoughtful touch! I did the same with the ledger paper and journalling too. Love your page. Lovely to 'meet' you! 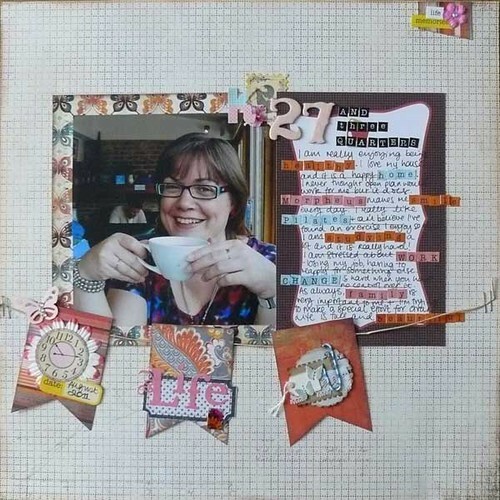 I'm intrigued by the way you've made some of the journalling stand out of the frame - such a great idea! OOO using your embellie for the banner is fantastic. Love the idea of your layout. Love your LO, really great. Love the inspiration you've taken from Kirsty's amazing style, LOL at the token cup of tea :D !! I'm totally grinning right now as when I saw your page, I thought how great the journalling looked and the cuppa in the picture. Great minds :D This is a gorgeous page, and I completely agree about the picture - some just seem to be made for an about-me-right-now page. The banner is amazing too - I think I'm going to have to try one of these. Thanks so much for taking part! I love this LO it's fab and works really well. Have a great hop. I was just looking around and I like the way you're scrapping!